A new pollution report by the World Health Organisation has ranked 14 of India's cities in the top 20 most polluted cities across the world. Here's the list. A new pollution report by the World Health Organisation has ranked 14 of India’s cities in the top 20 most polluted cities across the world. 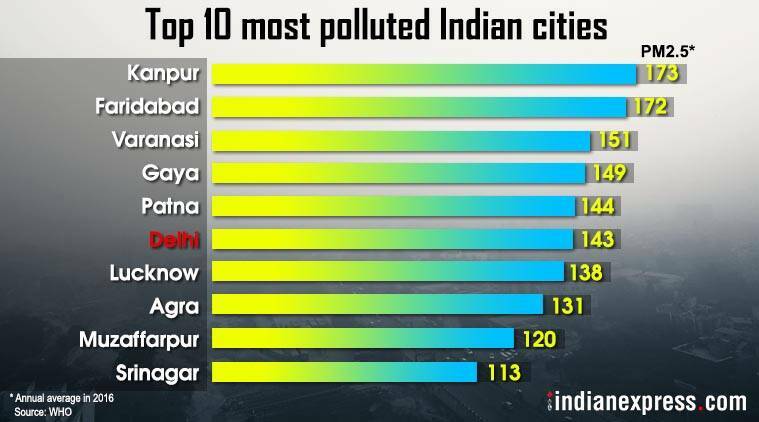 Taking into account PM2.5 levels, the data from 2016 — the latest — shows Delhi, Varanasi Kanpur, Faridabad, Gaya, Patna, Agra, Muzaffarpur, Srinagar, Gurgaon, Jaipur, Patiala and Jodhpur among the most polluted in the country. The study ranked 4,300 cities in 108 countries across the world. In terms of PM10 levels, 13 cities in the country feature among the 20 most polluted ones in the world in 2016. The WHO report has also found that nine of 10 people in the world breathe air containing high levels of pollutants. Further, according to WHO’s study, ambient air pollution caused about 4.2 million deaths globally in 2016. At least 3.8 million deaths were caused by household air pollution in the world. The report says that over 90 per cent of air pollution-related deaths occur in low and middle-income countries (including India), followed by low- and middle-income countries of the Eastern Mediterranean region, Europe and the Americas. “WHO estimates that around 7 million people die every year from exposure to fine particles in polluted air that penetrate deep into the lungs and cardiovascular system, causing diseases including stroke, heart disease, lung cancer, chronic obstructive pulmonary diseases and respiratory infections, including pneumonia,” the report stated. PM2.5 includes pollutants like sulfate, nitrate and black carbon, which pose the greatest risk to human health. Power plants, industry, agriculture, transport and inefficient use of energy by households are among the major causes of air pollution. Also read | What is PM 2.5?